With years of battling drug addiction and lawsuits with his ex-bandmates over the band name, Jack Russell is back in action and is seemingly full of vim and vigor judging by his new album He Saw It Comin'. Russell's latest partner in musical criminality is guitarist Robby Lochner and the duo are locked in from start to finish here. They co-wrote every song together (with a couple of other co-writers on two of the 11 tracks) and co-produced the disc as well. The album opens with "Sign Of The Times", a nicely honed uptempo song that is just the beginning of a surprisingly rocking and melodic track listing. Russell's vocals sound great and even touch upon a stage musical feel on "Godspeed", a song that feels like it belongs in a Broadway show with it's laser focus on the vocals and spare instrumentation. Lochner's guitar work is strong throughout but really gives a jolt of electricity on songs like "Don't Let Me Go" and the killer solo on "My Addiction". The latter song is replete with obviously autobiographical lyrics from Russell's own personal travails but the way they are spliced with a killer soundtrack makes the song all the more powerful. Things slow down on the contemplative ballad "Anything For You", but the throttle is thrown wide open on rockers "Crazy", "Blame It On The Night" and the nonstop thrill ride that is "Spy Vs. Spy". 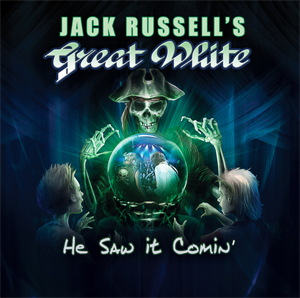 Simply taking the album as it is presented, all I can say is that JACK RUSSELL'S GREAT WHITE has come out with a highly energetic musical fun ride that is a simply pure enjoyable rocking musical experience. He sounds great and the music reflects and is reminiscent of his best days from his musical past. Pick up your copy of He Saw It Comin' in the KNAC.COM More Store right HERE.